Out of almond extract, trying to avoid it due to a nut allergy or just not a fan of the way it tastes? Not a problem. Just use one of these almond extract substitutes to keep your recipe on track. Replace the almond extract called for with twice as much vanilla extract. It will change the flavor of the recipe, but the vanilla should mesh nicely with the other ingredients. Almond extract has a much more concentrated flavor than vanilla, which is why you need to use twice as much to get the same impact. Another option is to replace the almond extract with an almond-flavored liqueur, like Amaretto. But you'll need to use four to eight times as much liqueur to maintain the same almond flavor in the recipe. That'll be a significant bump to the wet ingredients in your recipe, so you need to consider how this substitution will affect the finished product. It may be necessary to scale back on another wet ingredient in the recipe to accommodate the extra liquid from the liqueur. If you don't have any vanilla extract or almond liqueur on hand, or you're trying to avoid the alcohol in both, just leave the extract out completely. It'll change the flavor of your recipe slightly, but you should still get good results. 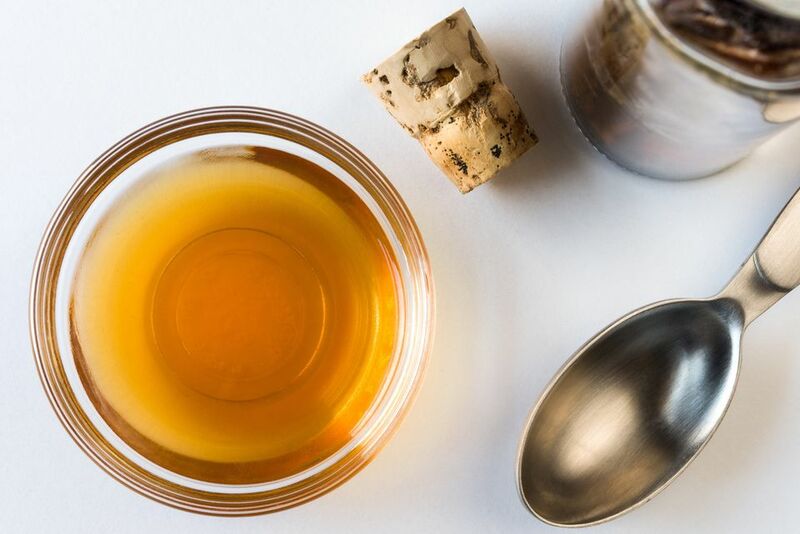 Generally, when an extract is included in a recipe, it doesn't contribute significantly to the liquids in the recipe; it's just there for that bit of flavor that it contributes. So, you shouldn't have to make any other adjustments to your recipe. While this won't help you with the recipe that you're working on today, you can also make your own almond extract for future use. It can be made with or without alcohol, depending on your preference. To start a batch, lightly toast a dozen skinned almonds in the oven (this will help to bring out their flavor). Then, chop them into small pieces, and place them in a glass jar or container. Pour a cup of vodka over them, if you'd like to make an alcohol-based extract. Pour a cup of food-grade glycerin over them, if you'd like to make a non-alcoholic extract. Then, cap the container, and allow the extract to develop for a few months before you use it. Shake the jar regularly to ensure the best flavor. Your homemade extract won't be as strongly-flavored as commercial almond extract, which tends to be made with bitter almond oil, but it's still well worth making a batch. If you're trying to avoid alcohol entirely, check out this list of alcohol substitutions for cooking and baking, and if you're trying to avoid nuts, be sure to check out this list of nut substitutions.